The name of this Archangel means "Who is like unto God?" In the Old Testament he is made known to us as the "great prince," the protector of the children of Israel (Daniel 12:1). Through the New Testament the Church continues this patronage of Michael (Revelation 12:7) and has always venerated him as the guardian angel of the kingdom of Christ on earth, as the heavenly leader in the fight against all enemies of God. For this reason he was the special patron of Christian soldiers fighting against pagan armies. 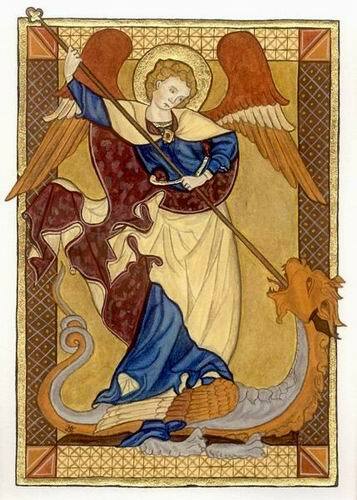 In the fierce battles of the imperial troops against the heathen Magyars in Bavaria (933 and 955) Saint Michael’s help was invoked by all fighters with prayer and song and battle cry, and the victory was gratefully attributed to him. His feast, originally combined with the remembrance of all angels, had been celebrated in the West from the early centuries on September 29. The Synod of Mainz (813) introduced it into all the countries of the Carolingian Empire and prescribed its celebration as a public holiday. All through medieval times Saint Michael’s Day was kept as a great religious feast (in France even up to the last century) and one of the annual holiday seasons as well. The churches of the Greek Rite keep the feast on November 8, and a second festival on September 6. In art, Michael is often depicted slaying a demon at the Apocalypse or weighing souls on Judgement Day.